Welcome to the Jackie Robinson Memorial Baseball League! Jackie Robinson Memorial Baseball League! The Jackie Robinson Memorial Baseball League is an APBA/Baseball For Windows baseball league that started play in 1998, with the 1947 season, to honor the anniversary of Jackie Robinson’s debut. 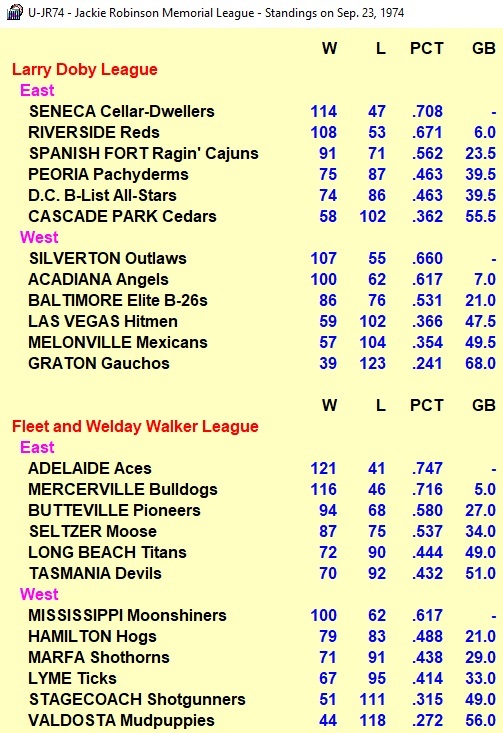 The league began as a winter league, but is now playing continuously, having completed the 1970 season. It is a full-roster league, expanding and changing rules along with the accompanying Major League season. We recently completed our third round of expansion in 1969, along with the accompanying Divisional Play. The DH looms for the Doby League in ’73. Adam Ginsburg was the founding commissioner. Chris Strovel took over from ’49-’55, ’57-’66, and 1971. Steve Galbraith ran the league in ’56, and returned as commish for ’67-’70. The league has seen teams rise to prominence for mini-dynasties or longer. Edgewood won seven straight Walker tiles from ’52-’58, followed by three straight pennants for Long Beach. Edgewood came back to cop its eighth pennant in ’62, followed by… you guessed it … Long Beach in 1963 and 1964. The two teams represented the Walker League in every World Series from ’53-‘64 The ’62 Walker pennant race was an all-time classic, with Edgewood returning to the top with 106 wins, beating out three other 100-win teams! In ’64, Seltzer staged an incredible rally to tie the race on the last day of the season, but Long Beach swept what became a two-game tie-breaker. Seneca rose from the first expansion to become a power by the Summer of Love, but has not be able to clear the LCS despite winning 245 games in ’69-’70.